CSS supported the EPA Superfund Technical Assessment and Response Team (START), which has been working with state and local agencies to direct Enbridge's oil recovery efforts since July 2010. 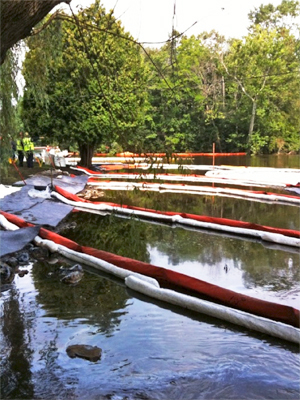 At that time, a pipeline rupture near Marshall, MI caused the largest inland oil spill in Midwest history. As of October 2011, more than 1,139,000 gallons of oil were estimated to have been contained in the contaminated waste streams generated by cleanup work. These waste streams included oily water, soil, sediment and debris. CSS provided 19 professionals in various field and data management roles to support these efforts. We monitored boom placement by the Principal Responsible Party (PRP) and collected sediment, soil, air and water samples. We provided field observers to monitor site activities over the many recovery locations, boom locations and wildlife rescue operations. Our GIS professionals created numerous maps with data collected in the field by the START teams, state and local regulators, and PRPs. Our staff managed the large amount of information collected, working with the SCRIBE program (EPA's Environmental Data Management program) and using the EPA Region 5 Rapid Assessment Tool real-time field data collection system.